Caption slip reads: "Photographer: Swaim. Date: 1960-05-13. Reporter: Swaim. Assignment: Senior center. 24: DEO (standing left) and Myrtle Lien pause in looking at stamp album to say 'welcome, stranger' to Frank 'Pappy' Case, 89, in patio of new Pasadena Senior Center, which will open next Sunday. Mr. and Mrs. Lien are charter members, Case a retired Salvation Army worker. 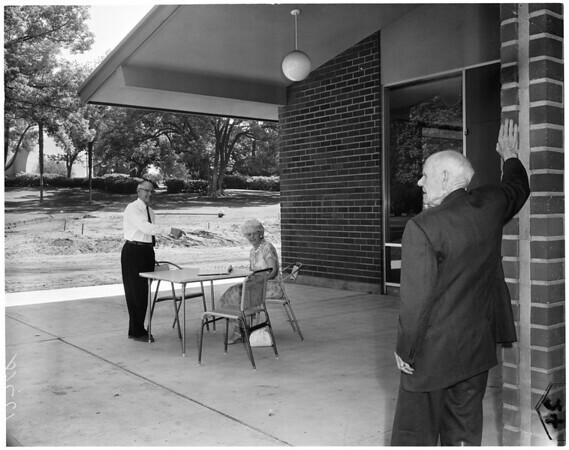 34: Deo (seated left) and Myrtle Lien, playing 'Scrabble' invite Frank 'Pappy' Case, 89, to join them in the game at New Pasadena Senior Center".